Prospect Hill Cemetery adjoins Glenwood, and covers about eighteen acres of undulating land. It is easy of access from Washington, and from the northern hill the view is magnificent. To the south lies the Metropolitan city and the noble Potomac, whilst the intermediate space, with its stately trees and drooping foliage, adds that variety to the landscape which is so much admired. Part of the land has been cleared, but the remainder, by far the smallest portion, is a fine grove. It was purchased by the German Protestant Evangelical Association of this city for the sum of $7,200, of which $5,000 remains to be paid. Their old cemetery beyond the railroad on H street east becoming too small, this purchase was rendered necessary. The ground is still in its native wildness, not having been surveyed, but yet it strikes the observer as a fitting place for the last resting place of the dead. It will shortly, however, assume another appearance, the deeds having been secured, and all the preliminaries arranged. This association has been in existence some ten or twelve years, having been formed in the 1846 or 1848. There were then but thirty members, and their prospects were anything but encouraging. Since then, however, they have been rapidly increasing in numbers and influence, until they have enrolled at the present time upwards of one hundred members, and confidently expect a further increase to two hundred before the close of the present year. Their pastor, the Rev. Mr. Finckley, is an upright, conscientious Christian and a very useful man. He has done much to build up the church, and, by his consistent “walk and conversation,” has made many friends. Their church is located in the first ward, on the corner of G and Twentieth streets, where it is convenient of access to the members who reside in Georgetown. The members of the association are compelled to pay two dollars a year, the object of which is to prevent the possibility of their being without a pastor. Persons can become members of the church without joining the association; but every member of the association must be a member of the church. There are similar associations in all of the principal cities of the Union. On Sunday afternoon last, about three o’clock, this cemetery was dedicated with appropriate ceremonies. The day was calm and pleasant, and the attendance was unusually large. There could not have been less than two thousand persons present, and, from the manner in which they conducted themselves, there were but few of them who did not feel the solemnity of the occasion. The scene was full of interest, and the impression which it left will be remembered for many a day. The sun light gilding the tree-tops, illuminating the Capitol, plainly seen in the distance, and glistening upon the Potomac, with the fond association of friends and home, could not but render life desirable; and yet the very object of their assembling kept their thoughts intent upon the close of life and their last resting place. All ages were represented: extreme old age, middle age, and youth were there. Many, no doubt, are thoughtless and careless of their most important interests, but they could not have witnessed the ceremonies without feeling that there is some preparation necessary to meet death. Many of the spectators assembled upon the ground before the time fixed upon for the commencement of the exercises, but the majority formed a procession at the German Hall, on Eleventh street, between F and G streets. Two fine bands were in attendance, discoursing appropriate music. The procession was composed of the German school, numbering upwards of a hundred scholars, the Red Men, the Union Benevolent Society, and Franklin Lodge, with appropriate banners. The banner borne by the school children exhibited a faithful portrait of the “Father of his Country,” and that carried by the Franklin Lodge an excellent likeness of Franklin. The German school was instituted in September, 1854, and the Union Benevolent Society in January, 1847. Wir haben uns hier versammelt zu einem außer-gewöhnlichen und feierlichen Zweck. Wenn wir Häuser, oder Schulen, oder Kirchen, oder Staatsgebäude bauen, so feiern wir die Eröffnung derselben durch irgend eine feierliche Handlung, und weihen sie für den Zweck wofür sie bestimt sind. Wenn wir aber zum ersten Mal, wie heute, den Platz betreten, wo nach des Lebens Mühe und Sorgen einst unser müder Leib die Ruhe finden wird die er im Leben vergebens suchte, so muß dieser Tag und diese Stunde von doppelter Wichtigkeit sein. Nur wenn es nicht mehr schlägt. Wir haben uns hier versammelt um diesen Platz zu einem Gottes-Acker zu weihen, zu einem Friedenshofe, zu einer Republik der Todten und zu einem Arsenal des Himmels. Nur hier finden wir eine Republik im wahren Sinne des Wortes, wo jeder Unterschied von Rang und Stand, von Alter, von Religion und Nation verschwinden muß. Hier wird der Reiche neben den Armen, der Säugling und Greis, der Fremdling und der Eingeborene, der Christ und der nicht Christ, sie werden in Frieden bei einander wohnen; hier wird der Mann der in der Fülle der Manneskraft die Elemente zu trotzen wähnte sich unter den mächtigen Cepter des Todes beugen, und Der, der mit Stolz und Verachtung auf seinen Nebenmenschen herabblickte, wird am Rande des Grabes die Erfahrung machen, daß der beste Adelsbrief der ist, als Mensch redlich seine Pflicht erfüllt zu haben. Und mit welchen verschiedenen Gefühlen werden wir und unsere Nachkömmlinge diesen Platz betreten. Es erfordert nicht den Blick eines Sehers oder Propheten dieselben zu beschreiben, Kinder werden hier an den Gräbern ihrer Eltern weinen, trostlos und öde und verlassen wird ihnen die Welt als ein Jammerthal erscheinen, wo alle Freuden verblühen, bis von geweihten Dieners Munde ihnen die Worte des Trostes zugerufen werden: daß der Gott der die Raben ernährt, der die Lilien auf dem Felde kleidet, der die Haare ihrer Häupter zählt, der ihrer Väter Vater war, auch ihr Vater, Versorger und Beschützer sein wird, und getröstet werden Sie diese heilige Stätte verlassen. Und sein Wort nie gebrochen. Witwen werden an den Gräbern ihrer Gatten weinen und in den ersten herben Schmerzen an Gott und an der Menschheit verzweifeln, bis von geweihter Stätte von geweihten Dieners Munde ihr die Worte des Trostes zugerufen werden, dein Gatte lebt, es gibt ein Jenseits, es gibt ein Wiedersehn. Dieses heilige Band der Liebe, das die Geister vereinigt, kann auch der Todt nicht trennen. Die Vernunft wird sich Bahn brechen, und wird ihr zurufen, daß das Ebenbild Gottes der Geist des Menschen, der seinen Schöpfer so nahe verwandt, der den Lauf und Bau der Sterne mißt, der Welten in Systeme zieht, der den Elemente Zügel anlegt. Der die beredeten Blitze durch den Boden des Oceans sendet und die Geister sich näher bringt, kann nicht für dieses kurze Erdenleben geschaffen sein, es muß ein Jenseits geben. Die Religion endlich wird ihre Rechte geltend machen, durch die Simbole des Glaubens, der Liebe und der Hoffnung. Blüht ewiglich ! und schöner die Natur. We have come to this place to perform an extraordinary and solemn act. After completing our dwellings, our school-houses, our churches, and other buildings, we inaugurate them in some formal manner, dedicating them to the purposes for which they have been destined. But when we enter for the first time the place we have prepared for the repose of the dead, where, after the sorrows and cares of life are past, our weary bodies are to find rest, the occasion must be of much higher importance. Finds peace – when the heart ceases beating! Religion, too, will assert its rights over the symbols of faith, love, and hope. Nature is joyous in eternal bloom. They are warbling hymns above. The nations of the earth have various modes in which they pay respectful tribute to the departed. The ancient Egyptians embalm their dead; the Hindoos burn them; the Jews entombed them; the Greeks and Romans gave them sepulture, or burned them, as they thought best; the Mohammedans bury them; but, since “life and immortality have been brought to light by the Gospel,” Christians of all denominations bury their dead with suitable religious ceremonies. This we conceive to be the most becoming mode, and well calculated to make salutary impressions upon the hearts and minds of those who remain “when the body returns to the earth as it was, and the spirit to God, who gave it;” and for this the burial place which we this day consecrate as “Prospect Hill Cemetery” is designed. The society which I have the honor to represent intends to offer, on the most reasonable and liberal conditions possible, single grave and family lots of ground to all who may desire them. At the conclusion of the Rev. Mr. Finckley’s address, the solemn service of consecration was read in German, and the assemblage was dismissed with the benediction. The German Cemetery of Washington, D.C. The dome of the U.S. Capitol consists of 36 cast- iron segments that fit together like slices of an orange. The plan for this complex design was devised and drawn by August Gottlieb Schönborn. This architect from Thüringen worked in the Office of the Architect of the U.S. Capitol from 1850 to the time of his death in 1902. He was called "the architect of the dome of the Capitol" in his obituary in the Washington Post. Schönborn lies buried in Prospect Hill Cemetery on North Capitol Street, which overlooks the U.S. Capitol and downtown Washington, D.C. Originally known as "der deutsche Friedhof in Washington, DC," Prospect Hill Cemetery was founded in 1858 by members of the Concordia German Evangelical Lutheran Church. This church was completed in 1835 at 20th and G Streets, NW, four blocks from the White House. John Philip Sousa was baptized here in 1854. Many of the monuments of Prospect Hill Cemetery were designed by Jacques Jouvenal, who emigrated to the United States in 1853 from Elsaß-Lothringen; these include his own, whose inscriptions are in German. He designed the statue of Benjamin Franklin that stands in front of the Old Post Office Building at 12th Street and Pennsylvania Avenue, NW. Commuting from the White House to his family's summer cottage at Old Soldiers' Home, President Lincoln rode about seven blocks to the west of Prospect Hill Cemetery. Riding north along Georgia Ave (old 7th St.), he passed W Street which led to Prospect Hill Cemetery about seven blocks away. In 1862, Architect Emil Friedrich designed a major addition to the first building of the National Deaf Mute College. It was in this building that Abraham Lincoln signed legislation establishing this as the third educational institution in the United States to receive federal funding, the first being West Point and the Naval Academy. Several years later, Friedrich designed four more buildings for the school known today as Gallaudet University. He too lies buried in Prospect Hill Cemetery. Here is also the Merchant-Taylor William A. Petersen of Hanover. It was in the house that Petersen built in Washington that the President died on Good Friday 1865. Joseph Peter Gerhardt of Bonn fought in the German democratic revolution of 1848. During the Civil War, he served as the commander of a German regiment and finally of a brigade. He led the large German contingent that marched down Pennsylvania Avenue to the Capitol at the funeral of President Lincoln. Brevet- Brigadier Gerhardt lies buried in the Cemetery along with about 40 other veterans of the Union Army. Here lies also Attorney Louis Schade of Berlin, who also took part in the 1848 revolution and who published The Washington Sentinel for 30 years. When speculators wanted to buy the house in which Lincoln had died, he purchased it in 1879 to preserve it for posterity. It is known today to tourists from all over the United States as "The House Where Lincoln Died." Here lies also Julius Frederick Viedt of Braunschweig, a lieutenant in the Union Army and the founding president of the Washington Sängerbund. They sang Goethe's "Gesang der Geister über den Wassern" under the dome of the Capitol before Lincoln's bier. In January 1893, members of the Sängerbund sang in Prospect Hill Cemetery at the funeral of their founding president. "Die Erinnerungen und Erfahrungen einer Generation gehen verloren, wenn sie nicht festgehalten werden. Jede Gesellschaft und jede Kultur errichtet deshalb Symbole und Zeichen der Erinnerung. Das können Denkmale sein oder besondere Feste und Gedenktage. Der französische Soziologe Maurice Halbwachs hat das einmal das 'kollektive Gedächtnis' genannt. Die Erinnerungen und Erfahrungen der vorangehended Generationen bleiben aber nur erhalten, wenn die Stätten der Erinnerung auch gepflegt werden. Kümmert sich niemand darum, dann verfällt das kollektive Gedächtnis,' und so wie das Unkraut über Steine wächst, wächst auch das Vergessen über die Geschichte der vorangegangenen Generationen." Prospect Hill Cemetery is one such place of remembrance for German Americans in the Nation's Capital. Here the memory of the contribution of past generations of immigrants can be nurtured. But that will be possible only if the Cemetery is morally and financially supported by the German-American community of the Washington area. There are about 14,000 persons buried in Prospect Hill Cemetery, 9,000 to 10,000 of them adults. The vast majority are of German heritage. Most persons buried there immigrated to Washington in the 19th century. There are, of course, also recent burials, and quite a few lots are still available today. Until the American Civil War, the U.S. Capital was little more than a village on the Potomac. It was noted for the magnificent distances between its few public buildings - but little else. Washington, D.C., did not become what might be called a city until the time during and shortly after the Civil War. Despite this building boom, Washington did not become a magnet for immigration. In the 1870's, about 9 percent of the adult male population of all races was Irish; 7 percent, German; and each of the other ethnic groups boasted no more than 2 percent. There was no large ethnic enclave in Washington. But despite their small numbers, the Germans made a unique contribution to the creation of the Cityof Washington; they provided an inordinate number of skilled craftsmen. The Memorial Day ceremony was sponsored by the German- American Heritage Society of Greater Washington, D.C., Concordia Church and the Prospect Hill Lot Owners Association (President: Carol Holler; Secretary: Carolyn Rossmiller; Treasurer: Jean Bischof Crabill; Trustees: Rudolph Becker, Annita Carmank, Albert Reitz and Henry Fankhauser). After the Memorial Day service, Superintendent Dennis Olson led the guests through the Cemetery. Everyone agrees that Mr. Olson and his wife Joan have performed far beyond the call of duty in maintaining and sustaining an important place in German- American collective memory-Prospect Hill Cemetery. Prospect Hill Cemetery opened just a couple of years before the outbreak of the Civil War. Before the War’s end, nearly 180,000German immigrants nationwide enlisted and fought as soldiers almost totally on the Union side. Some saw the war to save the Union as their second fight for freedom, a continuation of the German Revolution of 1848-49, especially since some of their leaders – Carl Schurz, Friedrich Hecker, Franz Sigel – were the same men under whom they served in Germany. They knew they were fighting not only for the preservation of the Union and democracy, but also for human rights – for the liberation of the slaves, and for themselves. Although over the years little has been written about these German immigrant soldiers, their presence was very important in the outcome of the War. Confederate General Robert E. Lee is known to have said that if he could take the Dutch (Deutsche) out of the Union Army, the South could easily win the war. Their contributions were also recognized by Abraham Lincoln, who, in a letter to one of his generals, stated that ”the Germans are true and patriotic”. The Union army allowed immigrants to form their own units, elect their own officers, and speak their native language. In Washington, DC, this was the 8th Battalion, especially Company A, of the DC Volunteers or Infantry. President Lincoln referred to them as his ”faithful Germans” and selected them to be his guards at his inauguration in March 1861. Known as ”Gerhardt’s Company” (under the leadership of Joseph Gerhardt), or the ”Turner Rifles”, these young men were initially assigned to perform guard duty at Washington’s public building and at the roads and bridges which gave means of entrance into the city. Once the city because secure with the arrival of about 75,000 soldiers from the north, the 8th Battalion became the advance guard in the first movement into Virginia. They followed General Stone up the Potomac Rive as far as Harper’s Ferry. Later they were stationed at Great Falls to protect the waterworks which supplied Washington with water. We know of nearly 200 Civil War veterans who now rest at Prospect Hill. More than half lived in Washington and served in its 8th Battalion. Others enlisted elsewhere, came to Washington, and remained here after the war. And most likely there are those buried here whose military status is unknown to us; this would be particularly true of those buried here during the war. As you look out upon the grounds of this cemetery you can see numerous Civil War headstones; others have no stones by which to be identified. We owe our deepest gratitude to all of them for their role in keeping their – and our – homeland united. WHEN ABRAHAM LINCOLN arrived in Washington for his first inauguration, he faced the threat of assassination. One of the few armed units the President-elect could rely on in pro-Southern Washington was the 325-member Deutsche Jäger or German marksmen. These volunteer militiamen had assembled in January 1861 to protect the Capital City. They consisted of members of the Turner Rifles, the Washington Schützenverein and other German- American organizations. They helped protect Lincoln during his inauguration on March 4. They shielded him from potential assassins by marching beside and behind the open carriage that carried him to the U.S. Capitol and back to the White House; at the same time, green-coated sharpshooters occupied roofs of houses along the Pennsylvania Avenue inaugural route. President Lincoln called them his "faithful Germans." Gen. Winfield Scott, the supreme commander at the outbreak of the Civil War, ordered one of the first Federal offensives of the conflict when he sent a 2,500- man force under Col. Charles P. Stone to secure Montgomery County along the Potomac River. 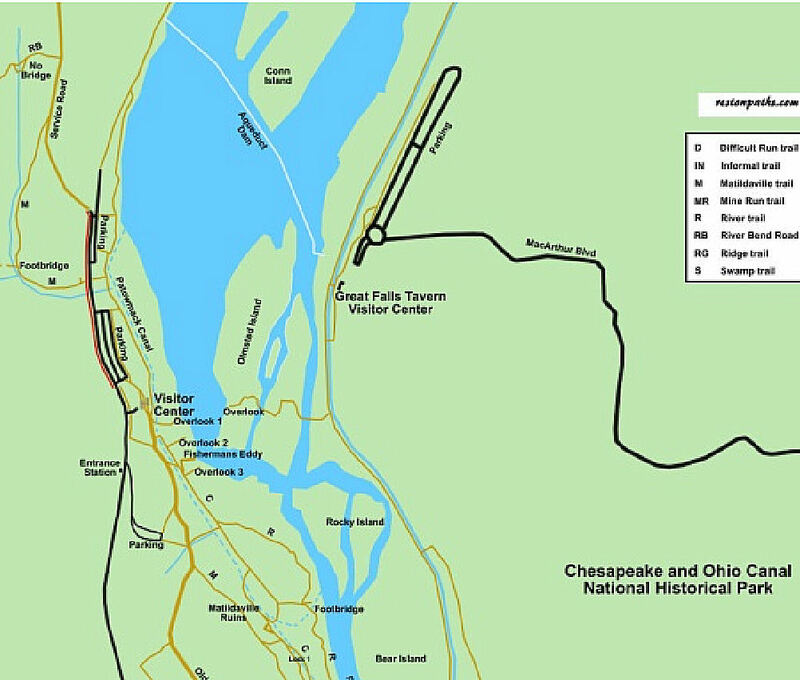 Scott intended to cut off the flow of supplies into Virginia and reopen the blocked Chesapeake & Ohio Canal. By 11 June 1861, Stone had established his headquarters in Rockville, MD, and dispatched troops to nearby river towns and crossings. Captain Joseph Peter Gerhardt from Bonn was assigned the command of the 8th Battalion of District of Columbia Militia during this Rockville Expedition. In this unit were assembled the various German- American militia contingents including the Turner Rifles. On 10 June, the Battalion arrived at Tennallytown, District of Columbia. Tenleytown (modern spelling) is at the intersection of Wisconsin and Nebraska Avenues. From downtown D.C., the shortest route would have been via Wisconsin Ave. The 8th Battalion was ordered to Tennallytown to guard the lines of communications with Washington headquarters. On 21 June 1861, the Battalion was ordered via Aqueduct Road (today MacArthur Blvd.) to Camp Great Falls on the Maryland side of the Potomac River. The 8th was sent there to protect the pipeline that carried Washington's drinking water beneath Aqueduct Road. The Great Falls of the Potomac are about 14 miles north of Washington, D.C. The Potomac River Aqueduct Intake Dam (5900 MacArthur Blvd.) is a few hundred feet upstream from Great Falls. This dam is between Conn and Olmstead Islands, near the Great Falls Tavern Visitor Center. From there the water flows along the Aqueduct to two reservoirs just west of Georgetown. Construction began in 1853, and portions of the Aqueduct went online in 1859 (Wikipedia, the free encyclopedia, "Washington Aqueduct"). On July 7th, at an early hour, about 200 Rebels appeared at the Virginia side of the Great Falls and commenced firing. The German-American 8th Battalion returned the fire from the Maryland bank; after the exchange of a few volleys, the enemy retired. However, the secessionists returned in the afternoon about 5 o'clock with reinforcements comprising a body of cavalry. The firing was kept up with spirit on both sides for several hours, and two men of Company B were struck. They were Privates John Ricks (30) and Martin Ohl (29). John Ricks is called "Henry" Ricks in a German account of this incident, and he is listed among the active members of the Washington Sängerbund (Frank Pierce, The Washington Saengerbund: A History, p. 13). Why "John" and "Henry" for the same man? In the traditional German naming system, boys were routinely baptized John or Johannes after the chief saints John the Baptist and John the Evangelist. To avoid confusion, a second name was added; this was the Rufname or call name. Thus to Germans, John Henry Ricks would be known as Henry Ricks except on a few formal occasions where John would also come into play. But for Americans, John would be the first name and Henry only the middle name, reduced to an H if used at all. This battalion of District of Columbia Militia returned to Washington, D.C., at 12 PM on 10 July 1861. As stipulated by law, it was mustered out of service between 10 and 24 July 1861. The muster role contained 397 names. The skirmish line of the 8th Battalion of D.C. Militia would have reached from the Great Falls Tavern parking lot down to Bear Island. They were there to protect the Aqueduct that conveyed drinking water from the Potomac river to Washington, D.C. As can be seen on the map, the Aqueduct Dam directs the flow of water to the Aqueduct intake near the Great Falls Visitor Center. From there the Aqueduct conducts the water beneath MacArthur Boulevard to reservoirs in Georgetown. Above is the fenced-in D.C. Armory Square between 4th and 7th Streets, SW, on Independence Avenue (where horse-drawn vehicles may be seen). 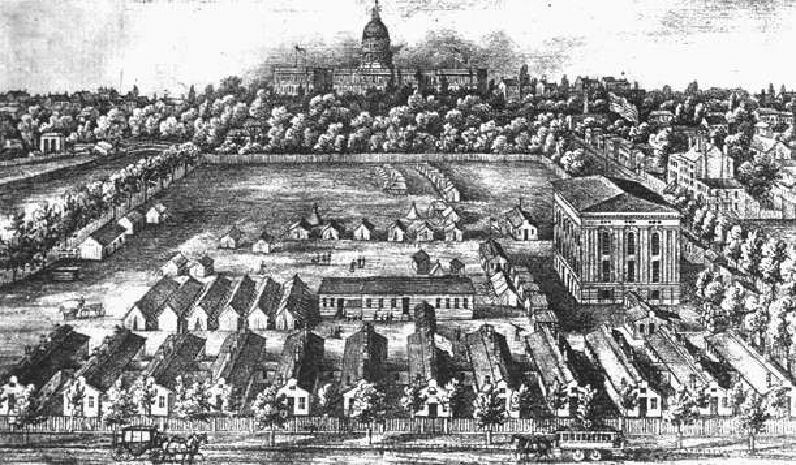 The tall building on the right is the D.C. Armory, which was erected in 1856. The funeral of Privates Henry Ricks and Martin Ohl was held in the Armory prior to their burial in Prospect Hill (German) Cemetery on North Capitol Street. The bodies were conveyed by canal boat from Great Falls, MD, down the Chesapeake & Ohio Canal; its extension called the Washington City Canal ran about three blocks north of the D.C. Armory (along today's Constitution Ave.). The smaller buildings in Armory Square are temporary hospitals. The Smithsonian's National Air & Space Museum stands here today. The artist placed the Capitol in a visually advantageous (but wrong) position. Jacob Funck, who had laid out Hamborg in Foggy Bottom, declared that in 1768 he had received 5 pounds current money for a lot and burial ground for a German Presbyterian Church and likewise 5 pounds for a German Lutheran Church. These lots passed into the ownership of the church founded in 1833 at 20th and G Streets, NW, Washington, D.C. They formed the material basis for this church. It is known today as the United Church?Die Vereinigte Kirche. This congregation celebrated its 175th anniversary this year. From this church emerged the Washington Sängerbund and Prospect Hill German Cemetery. Funck’s statement was witnessed by Anthony Gosler and Daniel Reinzel. Gosler is mentioned in the 1783 assessment and the 1790 census as living with his family in Georgetown. We know a little more about Daniel Reinzel or Reintzel. Johannes Daniel Reintzel was born in 1755 in Berks County, Pennsylvania. The 1783 assessment has him living in Georgetown. In the fall of 1793, Daniel was appointed by the Commissioners of the new Federal City to help conduct a drawing to raise money for the construction of public buildings. At the beginning of the 19th century, he is living in his house on M and 33rd Streets. (It stood there until 1967.) We also know that he was Presbyterian; therefore, we may assume that he represented the German Presbyterians or Reformierte. Gosler probably represented the Lutherans. Reformed and Lutherans united as die Deutsche Evangelische Gemeinde Concordia. Evangelisch means Protestant. Daniel Reintzel’s father, Johannes Valentine Reintzel Sr., arrived in Philadelphia in 1738 aboard the ship Friendship. The English spelled his name on the ship’s manifest as “Valatin Rinisell.” He was a Palatine or Pfälzer, and he boarded the ship in Rotterdam, Holland. Daniel’s mother was Maria Sarah Riegel; she was from around Kaiserslauten, Rhineland. They were married in 1740 in Pennsylvania. After her death, the father moved to Georgetown, Province of Maryland, around 1767. He died in Georgetown after 1790. Funck’s statement is not dated, but it was written around 1770. In that case, Daniel Reintzel would have been only 15 when he witnessed Funck’s affidavit. It is unlikely that the German Presbyterians of Georgetown would have sent an underage representative; therefore, it is more likely that he personally represented his father, Valentine Reintzel Sr. Thus, we may assume that it was Reintzel Sr. who put up the 5 pounds for the Presbyterian lot. Daniel Reintzel became an officer of the Georgetown Masonic Lodge as did his brother Anton Reintzel. Masons enjoyed great prestige in 18th century America. Not only were George Washington, Benjamin Franklin, Paul Revere, Lafayette as well as Lewis & Clark Masons but so were nine signers of the Declaration of Independence and thirteen signers of our Constitution. And so was Jacob Funck. Daniel’s younger brother, Johannes Valentine Reintzel Jr., was a Georgetown Councilman and merchant. As members of the Georgetown Lodge, the three brothers took part in the laying of the cornerstone of the President’s House. The procession formed at Sutter’s Fountain Inn in Georgetown and proceeded to the President’s Square. In an excavation at the SW corner of what became the White House, President Washington and other Masons placed a plate of polished brass. It read, “This first Stone of the President’s House was laid the 13th Day of October, 1792, and the 17th year of Independence of the United States of America. On top of this plate they set the corner stone. After the ceremony, they returned in regular order to the Fountain Inn where 16 toasts were drunk including to the 15 United States, to the President of the United States, to the fair daughters of America, and to the memory of those who bled in the cause of liberty. 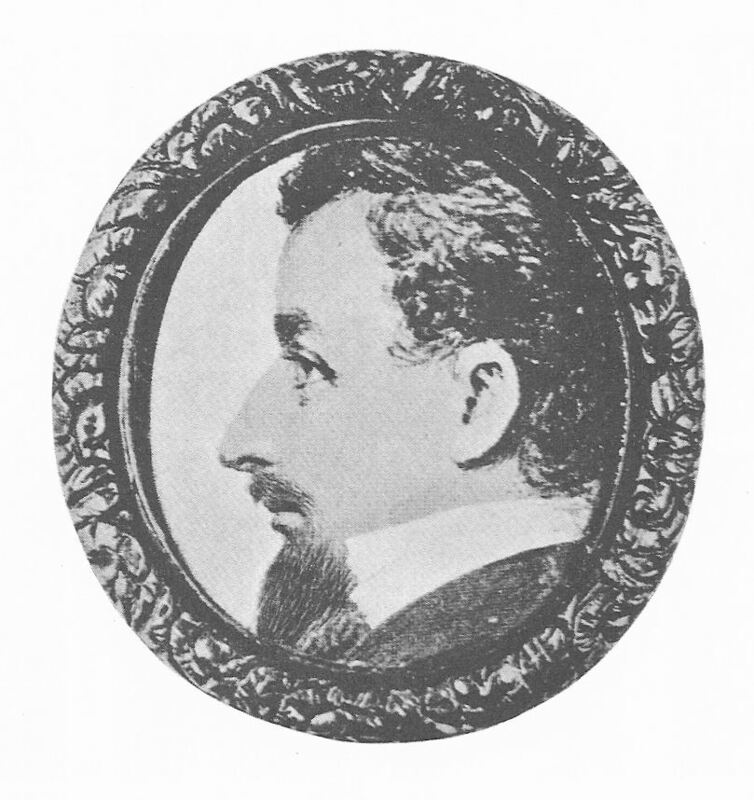 Valentine Reintzel became Worshipful Master of the Georgetown Lodge of Masons in 1793. As such, he assisted George Washington in laying the cornerstone of the U.S. Capitol. After crossing the Potomac, Washington was received in Georgetown by his Alexandria Lodge and by the Georgetown Lodge headed by Valentine Reintzel. From there they marched in solemn procession to the President’s Square, where they refreshed themselves. (The President’s House was still in the process of construction.) Then, “The procession marched two a- breast, in the greatest solemn dignity, with music playing, drums beating, colors flying, and spectators rejoicing; from the President's Square to the Capitol, in the City of Washington…” (Columbian Mirror & Alexandria Gazette). They reached the SE corner of what was to become the Capitol of the United States. There Washington, Reintzel and three other Masonic dignitaries stepped into a trench. Here they helped Washington cement a large silver plate to a stone bed. It read, “This South East corner Stone of the Capitol of the United States of America in the city of Washington, was laid on the 18th day of September 1793, in the thirteenth year of American Independence, etc.” The cornerstone was lowered onto this plate by means of block and tackle. After the ceremony, the participants feasted on a roasted oxen weighing 500 pounds. Washington handed the gavel that he had used to Worshipful Master Reintzel. This gavel is being kept to this day in the vault of Riggs Bank on M Street and Wisconsin Avenue. It may be seen from the lobby through a window when the vault is open. It has been used on some other solemn occasions by the Queen of England and by several U.S. Presidents. In the Capitol building is a sculpture that shows Reintzel aiding Washington in laying the cornerstone. This ceremony is also captured in a huge mural in the George Washington Masonic National Memorial in Alexandria, VA.
From 1803 to 1808, Valentine Reintzel served as Mayor of Georgetown. Reintzel lived in a three-story brick house on the west side of Jefferson Street between the C&O Canal and K Street. Here’s where his lodge met. In 1811, the lodge erected a hall at the NW corner of Thomas Jefferson St. and the C&O Canal; this building is still standing. In 1811, Reintzel became the first Grand Master of the Grand Lodge of the District of Columbia. He died in 1817 and was buried in the Presbyterian Cemetery in Georgetown. When this cemetery was moved, his Brother Masons re-buried his remains in 1907 in Glenwood Cemetery, which borders on Prospect Hill Cemetery. He lies in the Masonic Circle near the entrance to the cemetery. The Grand Lodge has instituted the Valentine Reintzel Medal, as an award for Meritorious Service; it bears his likeness. 1 This was actually the 16th year of Independence. 2 This was actually the 17th year of Independence. In the 19th century, European emigrants typically had little property or education. The Germans were an exception. They came from all areas of Germany and represented all regional origins, educational levels, economic standing, and religious and political orientations. A sizable number were craftsmen who hoped to preserve their method of earning a living. Some chose Washington, DC, as their new home. Washington is unique because it is a planned capital city. George Washington envisioned the city not only as a seat of government but also as a thriving industrial metropolis. However, over the years the city never gained an industrial base, which until 1860 was one factor that kept the city from growing. Until the Civil War began, Washington, DC, was a small Southern city. However, during this war the District of Columbia experienced a phenomenal growth of population, from 61,000 in 1860 to 110,000 citizens in 1870. Meeting the needs of such rapid growth was not an easy task. Since Washington could not provide for its growing needs through increased local factory production the talents of craftsmen were especially important. It was especially during this period the German immigrant craftsmen made major contributions to the successful growth of the capital city. A study of nearly 30,000 male workers in the 1870 federal census for the District of Columbia indicated that only 7% were from Germany. In addition, 9% were from Ireland and 2% from England. Men from many other countries made up another 3%. About one- quarter of American- born workers were skilled craftsmen, as were one- fifth of those from Ireland and a little more than one-third of those from Great Britain. In comparison, half of the Germans were skilled workers. As the city grew so rapidly, it was the Germans who disproportionately helped meet the everyday needs of its citizens. More than half of the city’s bakers and confectioners were of German birth. Of skilled workers helping to meet the city’s need for nourishment and clothing, one-third were German, as were one third of the city’s cabinetmakers and upholsterers. These immigrants also helped bring culture and beauty to the city. Four of the city’s five piano makers were German, as were nearly half of its watchmakers, and two-fifths of its jewelers. Saddle makers, gunsmiths, locksmiths, turners, instrument makers and model makers, they all made significant contributions to the rapidly- expanding nation’s capital city. It is important to remember that these percentages come from a group that made up only 7% of the city’s working male population. Of the men buried here at Prospect Hill, who lived and worked in Washington in 1870, more than three-fifths were skilled craftsmen. Therefore, they not only reflect the total 1870 German immigrant percentage of skilled craftsmen, they exceeded it. The German-American Prospect Hill Cemetery, established in 1858 and chartered by Congress in 1860, is one of the very few remaining reminders of the contributions German immigrants made to the growth of Washington during and after the Civil War. They enriched the nation’s capital city with their so-called “average presence” that made for a stable community. Their work and their place in the history of Washington, DC, should not be forgotten.